Join us and Conscious Alliance in the fight to end hunger and empower youth nationwide! We have teamed up with Conscious Alliance to host an ‘Art That Feeds’ Food Drive at our shows on July 5th thru the 7th at Red Rocks Amphitheatre. 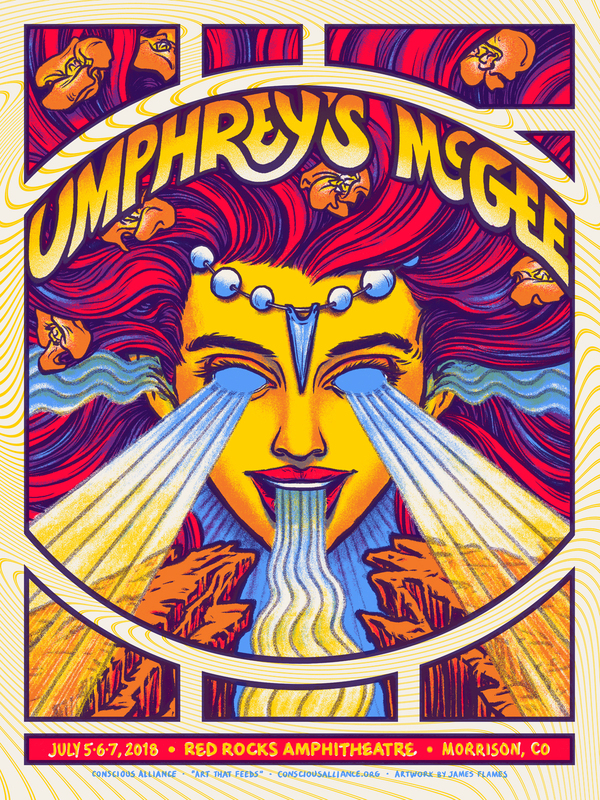 Donate 20 non-perishable food items or make a suggested monetary donation to the Umphrey’s McGee x ‘Art That Feeds’ Food Drive and receive a limited-edition event poster by James Flames. Donation bins will be located outside the Trading Post where Conscious Alliance volunteers will accept your 20 non-perishable food items and monetary donations. There will also be a Conscious Alliance booth at the top of the venue throughout the show where patrons can make a monetary donation for the poster. A limited number of posters will be available, so don’t miss out! donations are especially encouraged. Ramen Noodles will NOT be accepted in exchange for the poster.